War may be good for absolutely nothing, but the apparatus of violence and mayhem, reclaimed and rehabilitated, can possess a warped beauty of its own. Taken out of context and recast into new forms, shrapnel, bullets, and even firearms can transform from symbols of oppression to tools that incite social commentary. Above, a necklace made from detonated shotgun shells ($45) by Neutra Design. You know what gets us really fired up? Peaceful protests, civil debates, acting not reacting—anything that doesn’t involve fisticuffs or the barrel of a loaded gun. And we’re not the only peaceniks around here parts. 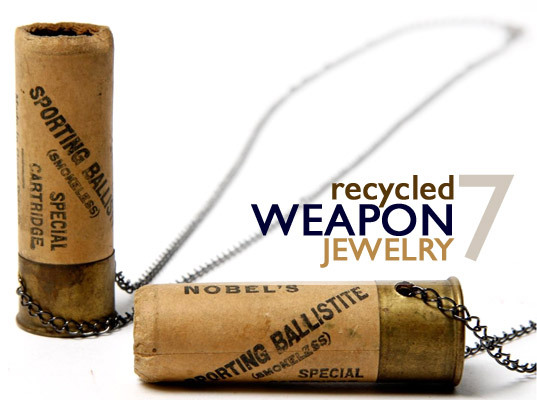 We’ve rounded up seven ex-weapons that have found new lives as wearable symbols of nonviolence, from bomb scrap-metal bracelets to necklaces made from dismantled firearms. The Gun Reclamation Project by B-Side Jewelry is a collection of pillaged gun parts (triggers, firing pins, recoil lugs) that are retooled as anti-violence jewelry. A portion of proceeds benefits the New York City Gun Buy-Back Program, which helps keep guns off Gotham's streets. Israeli designer Adi Zaffran Weisler takes spent bullets and shapes them into one-of-a-kind rings. Dug up from various firing ranges, the malformed metal resemble diamonds in the rough, forged from metal, fire, and gunpowder. In the Democratic Republic of Congo, children are kidnapped every day and sent into battle. Tiny soldiers, too little to carry a gun, are armed only with whistles to create as much of a ruckus as possible while receiving the first round of fire. 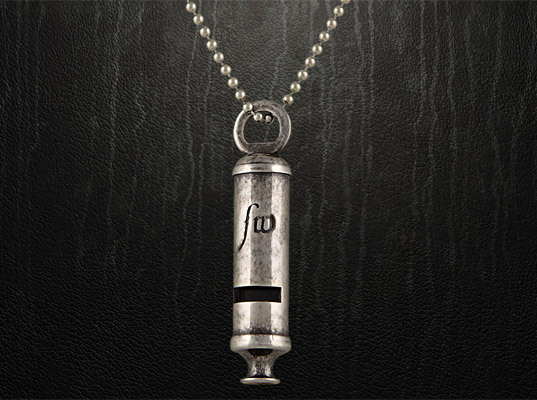 When you buy a whistle necklace from Falling Whistles, 100 percent of your contribution goes to rehabilitate and advocate for children of war. Article 22 derives its Peace Bomb bracelet from fragments of the bombs that once rained upon Laos during the Vietnam War. Profits from the bracelet offer the Laotian metalworkers a means of recovery from the devastation. These cuff links may not have a higher purpose—short of spiffing up your shirt, that is—but you have to admit that used 20-gauge shotgun shells, sliced up and polished to a gleam, make surprisingly dapper accessories. Founded by a former refugee, Akawelle offers a line of jewelry made from bullets used in Liberia during its civil war. The top of the bullet is is melted down and refashioned into a leaf-shaped pendant, then engraved with the word “Life” to symbolize the promise of new life from even the worst ordeal.